Down Syndrome International (DSI) hosted the 13th World Down Syndrome Congress in Glasgow this year, with delegates including those with Down syndrome, carers, professionals, practitioners, researchers, and organisations from all over the world, coming to the city to help realise the ambition of making it “The Congress by which all others are judged”. The Congress attracted over 1,000 delegates, of which over 120 were people with Down syndrome. A team of 11 Commissioners (adults with Down syndrome) volunteered to ensure a successful delivery of the event, participating in some of the many activities and evening events on the programme. This Commissioner programme was so successful that the association have decided to build upon their pioneering work and commit to developing this for the next congress to be held in Dubai – utilising the experience and expertise of the 2018 Commissioners to pass this on to the next host city and allow them to share their story. 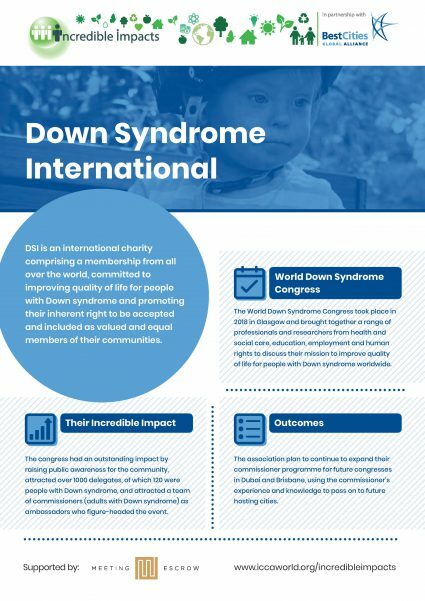 The DSI plan to give the grant directly to Down Syndrome Scotland, so that through their Commissioner programme, they can help build on the impact that can be created during the congress in Dubai in 2020, a BestCities destination, with the Emirates Down Syndrome Association. 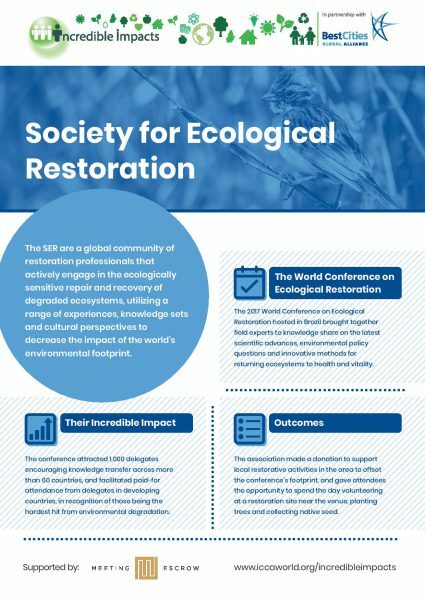 The Society for Ecological Restoration (SER) hosted their World Conference on Ecological Restoration in Brazil in 2017, where they convened a panel of experts, including the Managing Director of the World Bank, Executive Secretary of the Convention on Biological Diversity. the CEO of a leading environmental investment firm and other experts, to discuss solutions and strategies for ecological restoration efforts on a large scale. The conference saw delegates gather to share knowledge on the rapidly emerging field for a week of networking around the latest scientific advances, environmental policy questions, and innovative methods for returning ecosystems to health and vitality—whether forests, wetlands, rivers, streams or coastal areas. The SER used their conference as a platform for shaping the discussion of ecological restoration, attracting 1,000 delegates from more than 60 countries, and encouraged active participation by delegates from developing countries, in recognition of the fact that those countries are often hardest hit by environmental degradation. Furthermore, they gave attendees the opportunity to spend the day volunteering at a restoration site near the venue— from removing invasive plant species, collecting native seed to planting trees. They also offset some of the conference’s environmental footprint by financially supporting restorative activities in Brazil through a donation. The SER, with next year’s conference in Cape Town (another BestCities destination) will use the funds as a capacity building opportunity, enabling them to pass the knowledge gathered so far onto delegates in Africa and raise awareness of the importance of ecological restoration. The conference had a huge impact in the country, with the Mexican Government officially appointing the Cancer Institute of Mexico to coordinate the development and implementation of a sustainable national cancer control plan. They also advocated for Mexico to become a pilot for an initiative that calls for the cancer community to address the global equity gap, and the First Lady of Mexico was even inspired to invest in radiotherapy machines for some of the most deprived and remote areas of the country. 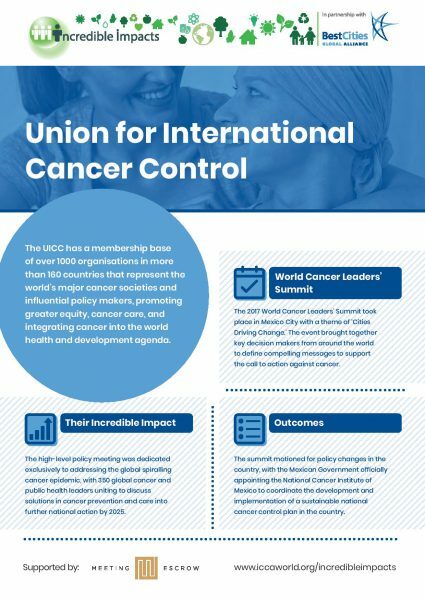 The UICC plan to put their funds towards further advancing the treatment for the cancer programmes taking place in Mexico following their successes with rallying the Government of Mexico. The Incredible Impacts grant programme 2019 will launch in January, and associations will have until 30th of June to submit their entries to the first round. Next year’s winners will be presented at ICCA Congress in Houston and will win a grant of $7,500 to invest into creating more incredible impacts. To find out more, visit the Incredible Impacts page.